Open source technology allows scientists, for the first time, to simulate how "all organisms on earth" interact in a changing environment. NAIROBI, Kenya/APO/ – A cutting-edge technology, named Madingley, has been released by Microsoft Research and United Nations Environment Programme World Conservation Monitoring Centre (UNEP-WCMC) which could help scientists and policy makers answer key environmental questions. Microsoft’s Computational Science Lab and UNEP-WCMC, based in Cambridge UK, have developed the first computer model able to simulate how all organisms interact on a global scale. The model creates a simulation of life on Earth, following a set of basic ecological tools found in the real world. With the rapid degradation of ecosystems worldwide, the ability to predict the likely effects of human actions on the natural world could prove vital the maintenance of the goods and services it provides, upon which we all depend. The Madingley model is able to provide this long-term, predictive and truly global insight previously lacking in other models. The Microsoft and UNEP-WCMC team have highlighted the importance of this technology as, unlike previous models, it is able to assess and predict human impacts on a diverse range of ecosystems. It can be applied to any ecosystem, marine or terrestrial, and can be applied at any scale from local to global. UN Under-Secretary-General and UNEP Executive Director Achim Steiner said, “Anthropogenic activities are causing widespread degradation of ecosystems worldwide, threatening the ecosystem services upon all life depends. Madingley is an exciting new technology which offers the scientific community and world leaders a vital tool to predict how unsustainable development pathways would affect the natural world.” “The model is the first to couple all of the key biological processes and ecological theory that underpin the life cycle and behaviour of living organisms, from energy acquisition, to feeding metabolism, reproduction, dispersal and earth. The tool will improve understanding of the causes and impacts of degradation, helping scientists and governments develop avoidance and mitigation measures,” he added. The team initially simulated the physical Earth with continents, oceans and a global climate, before inserting digital organisms. As the simulations progress over time, scientists are able to observe and assess how different types of organisms interact with environmental niches and, crucially, how they might be impacted by a changing environment. 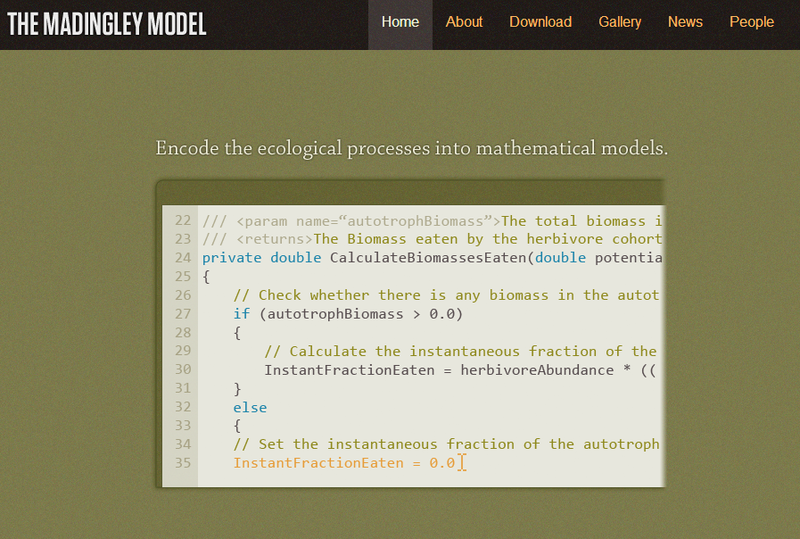 The Madingley Model is open sourced. It is hoped that the scientific community will dissect and improve the current version. “Our model is a first working version which will hopefully encourage other scientists to become involved in developing this, or analogous, global models of life” said Drew Purves, Head of the Computational Ecology and Environmental Science group (CEES) and co-author of the initiative. Scientists using the Madingley Model will now be able to answer crucial questions previously unanswerable. They will, for example, be able to show what will happen to an ecosystem if bees become extinct and they will be able to show decision makers how our world will look if action is not taken to safeguard our planet’s future.